AUD School of Arts and Sciences Associate Professor of Middle Eastern Studies Dr. Pamela Chrabieh has recently edited and published a book entitled Reeds from Red Lips on Arts and Gender in Southwestern Asia. The book includes diverse stories told through poetry and prose in English, French, Modern Standard Arabic and Lebanese, and encompasses a selection of conceptual photography artworks, digital visuals, cartoons and paintings. It features established scholars, poets and authors, journalists, artists and students, from Southwestern Asia or living in the region: Dr. Pamela Chrabieh, Norah Al Nimer, Katia Aoun Hage, Malak El Gohary, Amal Chehayeb, Lana AlBeik, Dr. Frank Darwiche, Noor Husain, Joelle Sfeir, Maram El Hendy, Dr. Omar Sabbagh, Karma Bou Saab, Farah Nasser, Haeley Ahn, Masooma Rana, Sandra Malki, Maya Khadra and Nour Zahi Al-Hassanieh. In her book foreword, Dr. Chrabieh explains that the diversity of Southwestern Asian voices is “so vast that it is unlikely to work on an exhaustive review, and this is definitely not the goal of the book; neither is it to obtain a fixed view of the gender and art relation (…). The book gathers the visions, journeys, statements, biographies and artworks of some authors and artists who either self-define or reject the gender binary by emphasizing the fluidity of gender and subverting gender conformity. It also displays a mosaic of languages and local dialects, visual techniques and writing styles; reeds that vibrate and produce different sounds and pitch ranges out of empowered lips”. According to Dr. Chrabieh, “most of those who contributed to this collective work are part of the Red Lips High Heels’ movement (http://www.redlipshighheels.com/), an online gathering project of writers and artists I launched in 2012 in Lebanon. This movement advocates peacebuilding, human rights and women’s rights in Southwestern Asia. (…) Southwestern Asia has unfortunately been too often stereotyped, viewed as homogeneous and demonized, but the authors and artists featured in this book deconstruct prejudices. They tell stories of the rich pasts and current diversities of this part of the world. They prove somehow that the local belongings, realities, memories and histories are quite complex, a mélange of grey zones and multiple shades”. Dr. Chrabieh adds: “I would like to express my gratitude to the many peoples who have been providing support to the Red Lips High Heels’ movement since 2012 and to this book’s project. I would like to thank in particular the authors and artists who allowed me to publish their works and my assistant researcher Haeley Ahn for her dedication and valuable input in the editing, proofreading and design of the book. To my students and former students at the American University in Dubai: thank you for inspiring me with your life stories, talents, skills and knowledge”. What influence does gender have on art production in nowadays Southwestern Asia (Middle East)? Does gender embody everyday life experiences, including the artistic experience? Are gendered spaces of the region Orientalized, demystified, or both? Are bodies, especially women bodies, described asexualized, passive and silent? Do local authors and artists living in diaspora reproduce totalizing or essentialist tendencies? Are power relations between the former colonizers and colonized uncovered? Has the aftermath of the so-called Arab Spring given women a greater voice and are more individuals willing to talk about gender openly? Is the view that assumes that women in Southwestern Asia are oppressed and left out of cultural debates a misconception? In her anthology Reeds from Red Lips, Pamela Chrabieh explores these questions through stories told from a wide spectrum of voices, all from authors and artists who dream of peacebuilding, human rights, and women’s rights in Southwestern Asia. Stories are told through poetry and prose in English, French, Modern Standard Arabic and Lebanese, and through a selection of conceptual photography artworks, digital visuals, cartoons and paintings. Pamela Chrabieh is Lebanese and Canadian Dr. in Sciences of Religions and Associate Professor of Middle Eastern Studies at the American University in Dubai. She is also the author of several academic and non-fiction publications on gender, women’s rights, arts in Southwestern Asia (Middle East), religions, peacebuilding and war memory. 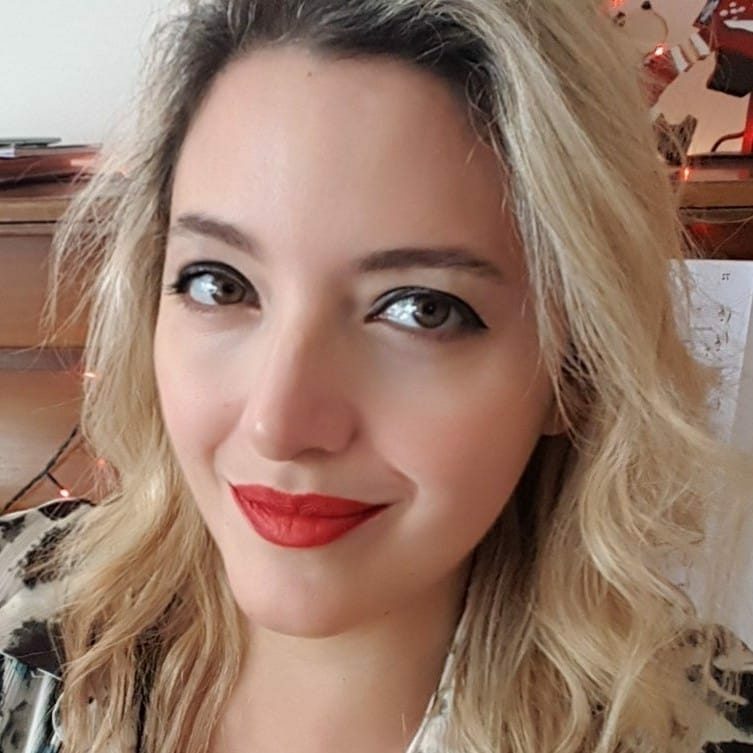 Artist-Painter who exhibited in Lebanon, Canada and the UAE, activist and founder of the Red Lips High Heels’ online platform, gathering more than 150 authors and artists who express their views on women’s rights and feminism issues. She has published in English, French and Modern Standard Arabic. Cher papa, je quitte le Liban pour la énième fois, rejoignant la cohorte des migrants et nomades chevronnés. Toutefois, ce départ est accompagné d’une plaie de feu. Assise dans un coin désuet de l’aéroport de Beyrouth, ville de paradoxes, de convivialité et d’identités meurtrières, je cherche les mots pour écrire la douleur. Ta mort soudaine, brutale, absurde est pénible à vivre. Ton départ frappe tel un ouragan que rien ne laisse présager. Tel mon beau-père, des années avant toi, assassiné en Irak de sang-froid, ton départ ne laisse aucune possibilité de préparation. Celui-ci laisse en fait des inachevés et des non-dits qui sont lourds à porter, tels tant d’autres départs d’une terre moyen-orientale meurtrie par les guerres successives ; des départs qui ne s’inscrivent pas dans l’ordre naturel des choses. Il va falloir que je continue papa, que je regarde la douleur en face, que je l’apprivoise et la transforme, que je reconnaisse ton visage dans les miroirs déformants de la réalité libanaise. Il va falloir que j’apprenne que les êtres humains ne sont pas réductibles aux malheurs qui les frappent, et que les leçons de la vie, qu’elles soient amères ou extraordinaires, édifient le fond de l’être, « havres de grâce pour l’âme naufragée qui n’ose plus croire » (Julien Green). Il va falloir que j’apprenne à continuer avec l’ordre et le chaos, les zones grises aux frontières floues, le sensé et l’insensé, les murmures, cris et pleurs, les coffres souillés, les jardins secrets et les matins ensoleillés du haut de la montagne que tu as tant aimée. Il va falloir que j’apprenne à croire que « la vie et la mort sont un, de même que le fleuve et l’océan sont un », et à « boire à la rivière du silence » pour pouvoir « vraiment chanter » (Khalil Gebran).